THE LEAK OF a private letter from rebellious cardinals to Pope Francis has revived a cloak-and-dagger atmosphere at the Vatican, with the spectre of “Vatileaks” and a butler’s betrayal rearing its ugly head. The letter, delivered by Australian Cardinal George Pell, was allegedly signed by 13 conservative cardinals who accused the pontiff of favouring liberals in a battle over the Church’s approach to gays and to divorced believers. It was published Monday by Vatican expert Sandro Magister, who is known for his criticisms of Francis’s papacy and who was expelled from the press room in June for breaking an embargo. In the missive, sent to the pontiff on 5 October, the cardinals described procedures for the three-week global synod on the family as “designed to facilitate predetermined results” on important disputed questions. “This is a new ‘Vatileaks’. A private letter belonging to the pope. How is it possible that it was published?” asked German cardinal Gerhard Ludwig Muller, calling for those responsible for giving it to Magister to be found. In 2012, Pope Benedict XVI’s butler engineered a series of leaks that embarrassed the Vatican, revealing as they did fierce infighting in the highest echelons of the Church and allegations of serious fraud in the running of the city. The mystery surrounding the latest leak deepened after four of the cardinals said to have signed the letter denied having done so. Pell admitted he had signed but said there were mistakes in the version published by Magister and that the list of signatures was incorrect. But others fear the Machivellian overtones of the council could signify a return of “Vatileaks”, which was pinned on the butler, but which religious watchers at the time said was likely fruit of a wider conspiracy. Email “Is 'Vatileaks' back? Machivellian cardinals are plotting against Pope Francis”. Feedback on “Is 'Vatileaks' back? 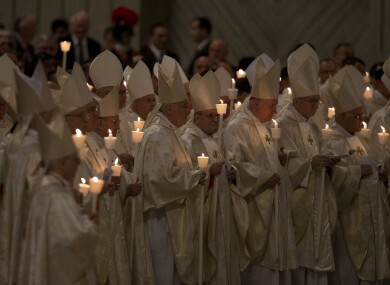 Machivellian cardinals are plotting against Pope Francis”.